A SAVAGE FUTURE. A VANISHED PAST. A MISSING KEY. Among the ruins of a civilization beyond their understanding, humanity clings to survival. Guilds vie for control of ancient cities, bandits ride glowing highways, and cyborg adventurers hunt for lost technology. 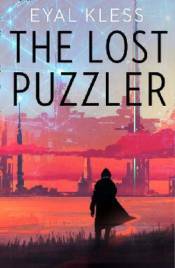 In the City of Towers, once the heart of the fallen Tarakan empire, a historian searches for clues to explain the disappearance of Rafik, a young boy with extraordinary abilities � a Puzzler. Marked with strange tattoos and gifted with a miraculous connection to Tarakan technology, Rafik could open doors inside the ruins, uncovering treasures and secrets. As Rafik's story is retold, it becomes clear that one lost boy may be the key to reviving a broken world or unleashing a new wave of devastation.